Phillip Silver is a Canadian set, costume, and lighting designer and professor. Born in Edmonton, Alberta, he graduated with a Bachelor of Arts (BA) from the University of Alberta in 1964 before studying production design at the National Theatre School of Canada. Since then, he has worked with various theatre companies across Canada, including Stratford Festival, Grand Theatre, London, Theatre Plus, Théâtre Français de Toronto, Canadian Stage, Tarragon Theatre, Canadian Opera Company, Theatre New Brunswick, Neptune Theatre, National Arts Centre, Manitoba Theatre Centre, Alberta Theatre Projects, and Edmonton Opera. He taught stage design at York University from 1986 until 2013 and was Dean of York's Faculty of Fine Arts from 1998 until 2008. 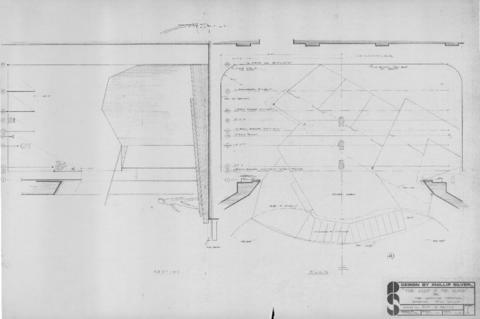 Set designs are annotated copies of the original drawings. Location of the originals is unknown. See the production records for this play in the Neptune Theatre fonds (MS-3-1) under the series "Production records," subseries "Night of the Iguana."